I am running through a deep jungle. Bright blurry shades of green mix with sharpdaggers of sunlight as I frantically leap to dodge the twisted roots in my path. Fear grips my heart, soaking into my bones and saturating my vision until the jungle transforms into a jumble of shifting shadows. I glance behind me into the thickening dark, not yet willing to face the thing that is chasing me and for a moment, I feel a sense of comfort. I am not alone in my escape. I glimpse an elderly Chinese woman running just behind me, her face contorted, her lips frozen in a half-scream. She motions for me to hide behind a large boulder. I obey and we are side by side, gasping for air and leaning against the smooth coolness of the rock. I realize she is clutching at something. 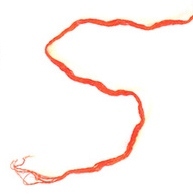 A fine silky red thread is spilling out between her shaking fingers. One end of the string trails away from her heaving frail body and disappears behind the boulder, into the jungle and the thing beyond. The other end of the string snakes its way to back to me and is firmly wrapped around my wrist. I peer down at the worn thread and notice the small indentations, cuts and scars it has left on my skin underneath. Her tired eyes tell me the weight of this thread is heavy, but necessary. She lays her warm hand on mine and smiles. I stagger to my feet and we both begin to run, the thread thicker and heavier now. We reach a rushing river with a series of long white tunnels stretching across. I must choose one to safely lead us to the other side. If I choose wrong, the thing will find us merely by following the red string. The old woman grabs me by the shoulders, the weight of her hands pushing down, her fingers digging into my neck. “Don’t go the old way,” she hisses. She points to a clump of leaves next to the river and I see it: A single white tunnel hidden behind the bush, much narrower than the others. A shaft of soft white light glows from inside. “Go on,” the woman’s voice commands. I step toward the tunnel and the red thread stretched between us begins to unravel. I hesitate, panic rising in my throat. “Go on,” the woman whispers. I take another step and the thread breaks, softly slipping away from my wrist. It falls away and vanishes. I open and close my hand. I feel light. I laugh. I am free. This was a recent dream of mine. It seemed incredibly strange and vivid enough to stay with me into the next morning. I thought, how odd to be dreaming about a red thread and this woman. How did this make any sense? But it kept popping back into my thoughts. Later that day, I was sitting in my car, taking my mother on errands, the usual daily humdrum, when I turned the radio on. I heard this female artist introducing a song. She said it was about the ancient Chinese belief that all babies are born with a red thread of fate. Some say it connects us with our “soulmate”. And this thread can be twisted, it can be stretched, but it can never break. Have you ever had things happen which you can’t explain away to coincidence? Signs that someone is trying to tell you something important? Well, this was that something. I had chills when I heard about this thread of fate on the radio, the day after I had that dream. I think my dream was sparked by a fellow blogger’s post that struck a chord with me, Lisa’s post, The Line Between, on her blog Woman Wielding Words. About how things seem to connect us with looping, repeating, invisible lines, like a web of sorts. Within the collective unconscious and woven into our deepest dreams, I can see this is true. After my red thread dream, I am beginning to see more clearly and understand the patterns in life we all must face, learn from and resolve. The most painful and raw of our emotions tend to follow us, no matter how hard we try to shake them loose by avoiding them or running away. Our relationships with each other (and with ourselves) are a direct result of how we deal with these innermost fears and demons. Some believe that these deeply ingrained patterns in our relationships can go back into other previous lifetimes. Perhaps they are replayed time and again until we make the decision to choose a different path and therefore finally achieve a positive outcome. My mother and I have had a tumultuous relationship our entire lives. It seems we keep pushing each others’ buttons until we both grow weary and bitter. Yet, we keep doing it. Why? Can’t I see that things won’t change if I choose this old path? Fear keeps me from trying something new. Our old habits may be destructive, yet we oddly feel they’re comforting. What if I approached my mother in a different way? What if I allowed myself to see things from her perspective and allow those old feelings of bitterness and resentment wash over me and drip away, releasing their grip? What if I broke that red thread that binds us? What if I chose to be free? I have a very strained relationship w/ my mother too, and it has been wearing on me in too many ways to even describe. You’ve given me some food for thought. thanks. My relationship with my mom has been strained since day one and we’ve gone through many cycles of the same anger and frustration. Now that we’re both getting older, I’ve noticed that if I approach her differently (changing my way of thinking and old knee-jerk reactions) I can see we are getting to know each other in a new light now. It’s still a struggle though. It’s never too late to change and I hope you and your mother can get there as well. What a powerful post filled with things to think about. That image of the red thread and you dream sent chills down my spine as well. Thank you for the pingback. I think its all connected. Lisa, your words and encouragement have helped me tremendously! Thank you. As have yours. One of the best things about this strange little community of ours is the encouragement and support we have for each other. Great post! We are, indeed, all connected. And particularly with our family members and close friends, we develop energetic cords of attachment. One thing that has dramatically helped me to get past my difficulties with my mother, was having a psychic friend cut negative cords of attachment between me and mom. My mom, in fact corded through me to my son (causing him difficulties). My friend is cutting those cords, too. They can go on for generations, and because they exist in our energy bodies, death doesn’t cut them. In any case, when negative cords are cut and sealed, you will find yourself becoming non-reactive in situations where your buttons would previously be pushed. There are other ways to achieve this non-reactivity, but I love cord cutting. The idea is to remove the buttons so they can’t be pushed. It’s amazing. You don’t have to fight old habits or grit your teeth. An akashic record healing is another tool that can totally change your (difficult) relationship with a person. I did one for my relationship with my mother, and I learned a lot to the point that I now feel sympathy, where previously I felt tremendous amounts of irritation. I have been finding energy work in cases such as this to be very powerful in healing our hearts and relationships. Sue, I find the cord-cutting idea fascinating. A few things have helped guide me on this journery with my mom. First, was the reading I had where she said my mother used to be my mother-in-law in a past life and she was just terrible toward me, berating me to the point of exhaustion. I wasn’t surprised to hear this because I do have this deep-seated resentment toward my mom in this life. I know in my heart this is true and explains a lot. Also, having had Reiki classes and meditating more has opened up the wiser spiritual side of me and has caused me to see things clearer and so I am much calmer. I would love to have an Akashic records healing one day. I’m sure that would help to heal those old wounds. I have had moments like that. I’ve had moments, too, where I’ll be taking certain steps and recall taking the same steps in a dream. In dreams, these innocuous moments have always devolved to nightmares, so that I’ll superstitiously step the opposite direction in the waking shadow of the dreams. Such little moves may lead us away from what seems to be predestined. I’d never thought about these moments as applicable to the whole of life, but in light of this post . . . it certainly seems they are! I hope you find the right steps toward freedom. Thank you, Deborah. Dreams to me are the key to what is truly going on and maybe addresses those things we aren’t willing to fully face just yet. I’ve always paid attention to my dreams and nightmares and have found the answers lie in them if I only listen to what my heart is telling me. I think certain people are put in our lives for the purpose of learning more about ourselves, as painful as it may be…but completely worth it in the end. I do believe in fate and destiny, but I also believe our free will can change the course. Thanks for reading my story. 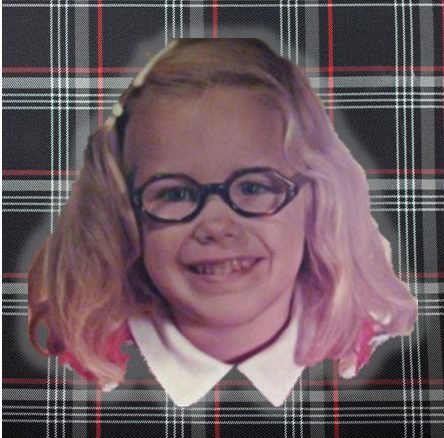 Oh my gosh, Darla. The way you wrote about your dream was incredible. Wow. I felt as though I was reading a novel. You know, that Twilight author began writing after a dream she had one night. Your dream – your excellent writing skills – this is the making of an incredible story. Of course, this story – this post – is a wonderful story, too. Gave me chills. P.S. My initial reaction when I saw the picture was that you were going to talk about a pregnancy test. Man, was I ever wrong, eh? Lenore, thank you! As always, you build me up with your positive words. And I had to laugh at that picture too so I took it down after I read your comment because I certainly didn’t want any of my family to think I was pregnant. Ahhh!!! 😉 But hey, maybe it is a rebirth of sorts I was talking about anyway? Nooooooo! (I say sweetly.) Put the picture back up – it was perfect! I didn’t mean to make you uncomfortable. My apologies. Seriously, as I read the post the picture tied in (no pun intended) beautifully. And seriously, the writing of this dream and the dream about finding out about your Dad – Darla, those are creations meant for books. Seriously. The new picture of the string reminds me of either a dream I had or a scary movie I watched?? Where someone was literally pulling a string out of their arm… am I making this up, or am I foreshadowing the novel you are in the process of writing, having been inspired by a dream? Yes, I think that is it. Great post and very well written. An incredible dream, and you described it all very well. Dreams can be so puzzling at times, and a lot of the time we can never figure out what they mean or why we had a certain dream. A very good quote by Edgar Cayce. Mags, some things just seem to all come together in a way that can’t be ignored. I felt drawn to Lisa’s blog and posts…then I had that dream, I heard the story about the red thread of fate the next day, then my brother called me up and mentioned to me that Edgar Cayce feels we repeat patterns in life so I found that quote. It all kind of fits like pieces of a puzzle. An “aha!” moment. Darla, there was never a doubt that your writing evokes emotions, and your sensibility nudges thoughts to probe. With this post, you have proven with apparent ease that you are a writer and a human with depth. Signs and symbols can’t be read by most. Those who do, get an opportunity to try a different path. It is admirable that you interpreted this connection between the dream and the thread in this way. All the very best with everything. Priya, I had to laugh after that dream because what the signs meant seemed so obvious, like someone was telling me something by basically hitting me over the head. I feel like saying, okay, okay, I finally get it now! I’ve always had vivid dreams but this was one strong enough to wake me straight up. I had to pay attention. I’m glad you liked it, Tori. Felt good to just get it all out. Wonderful description — clear and concise. And your choice of present tense is perfect for cranking up the tension. I wish I had complex and symbolic dreams like that. Mine are pretty lame. Thank you. You noticed that sidestep, huh? You guys really build me up, more than you realize! Thanks for always leaving upbeat positive responses, Charles. It first wrote it in past tense, then I changed it back to the present for that very reason. I am very happy that you enjoyed reading it. And, most of my dreams are pretty lame, too. Which is why this one really stayed with me, it woke me straight up and I could recall it perfectly the next morning as I scribbled it all down in my notebook. I didn’t quite connect it to my mother until later on but it was fun to figure out what all the symbols meant to me. What a vivid description of your dream. You have written it so well, it was as if I stood beside you. It was like reading a book. You captured me with your post. Thankfully, my relationship with my mother is good. There are the other relationships that I would like to fix… Well written. The older I get, the more willing I am to change and hopefully create a better understanding of my mother and our relationship. I suppose that’s true for all of us. Thanks for your comments, I am glad you enjoyed reading it. This is a very thoughtful, insightful post. Mothers and daughters always have such a complex relationship. I love my mother and would do almost anything for her, but we differ in so many ways. We both have to spend time all the time to make sure we truly understand each other. My daughter and I have a very different relationship. I think we understand each other too well. I hope you and your mom can find a smoother relationship because it could get exhausting otherwise. Your post really opened up a lot of soul searching. It is exhausting, Kay. Or, it used to be. Things are getting slowly easier as we have both decided to stop pushing those old buttons. That is interesting you and your daughter have a different kind of relationship. My daughter is only four, but I am already determined to have a better one with her…more open and supportive so I won’t repeat the past. Glad you enjoyed my post.